Previous chapter we have created our new clean repository but we did not added any code. In this chapter we will add some code and create some revision or versions of the code. As we stated before we have a clean repository we can check this. As we see status command provides some brief information about repository. We are on the master branch. We will look branches in the future. We have nothing to commit. Sure we have not added anything for now. 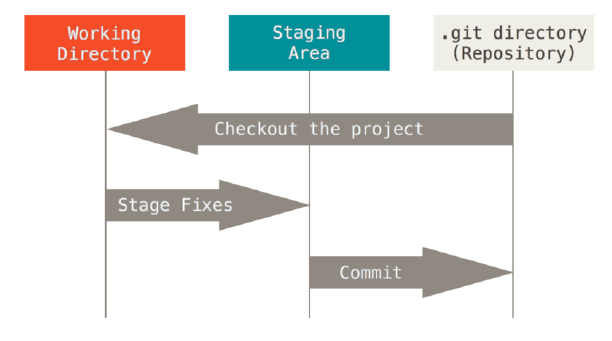 Git have some fundamental steps to commit. We will look them through writing our app. Below we can find the natural flow of a commit. We will create our app with the following code. We have created a file main.py with single line code. We have added some code to our project and want to see status of working copy. Working copy is currently used snapshot of the files. As we see mail.py is under untracked files. Untracked file is a files that is not added to the commit operation. So If we want to commit our file we should add main.py into tracked files. We have added main.py file to the tracking files. After adding file if we look to the status of working directory we can see that main.py is tagged as new file and there is no other untracked file. We can review status more shortly than default one. status show the current working status. We may want to see more detailed information about like the diff of the changes. Here is the solution. This is the code what is changed. Staging can be skipped with simple -a parameter like below. $ git commit -a -m"Without staging"
We issue same commit command for git. And we get following screen. Following screen show information about commit and wants some words about commit from us. We add Start to the beginning of the screen and then close it. And finally we commit our main.py . Was it hard? For now may be but after practicing it this is very simple procedure. We have worked on our project and added README.md file, changed the main.py to version 2. Now we have to commit again. As we always do we issue a git status command to see current situation. As we see that REAME.md is not tracked if we issue commit command. We need to it to the tracked files like below. We have added the README file. So we can continue to commit. $ git commit -m"Version 2, Add README"
We have commited more easily than before because we have provided the message . --amend used to update the last commit and new changes are added to the last commit. Unstaging is removing a file from stage and it will be untracked.